Discover why leaky homes still catch home buyers out! Leaky Homes, Are Water Leaks The Only Problem? There are 89,000 out there at last count. If it isn't leaking by now, then it must be OK right? All homes will leak at some point in their lives. When, and the amount of resulting damage depends on how well they were built in the first place! "The longer it takes from diagnosis to repair, the less value a property has in the marketplace now." Hi, I'm Gavin Lord, and I am still seeing first hand examples of new immigrant work colleagues, and family members being caught out when purchasing homes that up to now haven't exhibited any symptoms of being leaky homes. With the current high demand for homes, especially in Auckland, I am seeing many examples of homes offered for sale that would need close scrutiny before any purchase offer was made. For a quick overview of the most important facts you need to know as a home buyer or owner, download my free e-Book Leaky Homes Overview. This e-Book in PDF format will quickly provide you with key data that you need to ask about when viewing a prospective new home purchase. 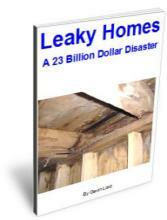 For a more comprehensive picture of the crisis, you can purchase my 52 page e-Book Leaky Homes a 23 Billion Dollar Disaster. This e-Book expands on the Leaky Homes Overview e-Book and covers the history behind the disaster, highlights the many appalling building industry decisions that led to the crisis, and explains why building framing comprising of softwoods must be treated, and much more. If you own a leaky home, or even suspect you might, I've found a very good 56 page Department of Building and Housing guide to remediation requirements that most councils seem to be following. 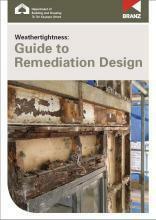 The purpose of the guide is to, and I quote, "provide some basic information to assist building designers undertaking design of weathertightness remediation solutions". Although the Guide is primarily aimed at architects and designers, it is also useful for home owners. I found the guide provided excellent practical advice on all aspects of dealing with a leaky home. The advice covers such areas as deciding what options are available to owners e.g. localised repairs, demolition or doing nothing, and the risks associated with each. It then proceeds to cover design and construction considerations in some detail with plenty of photos and detailed sketches throughout the Guide. I recommend this Guide to anyone who suspects their home may develop leaking issues, or it was built in the 1993-2004 period. discover the secrets realtors don't want you to know! In the late 1990s, early 2000s it started to become apparent that there was a problem with homes and buildings built during the previous decade. The media started reporting leaky homes with serious weatherproof issues and water damage. It didn't seem to affect only the lower priced end of the market. Multimillion dollar homes were becoming uninhabitable, if not downright dangerous to live in. A new word was invented, weathertightness. What Caused The Proliferation of Leaky Homes? In 1991 the Government of the day passed the Building Act which allowed builders and developers to cut corners in building construction. Many houses and buildings were built during the 1990s, early 2000s using methods that haven't withstood the test of time or weather. We have all heard about RTV silicon being used around window frames to seal them. These structures were doomed from the start by poor design, inappropriate materials being used and poor construction methods. One of the more common issues has been water or moisture getting behind monolithic cladding. If there has been no cavity created between the cladding and the framework, the water becomes trapped and cannot easily escape or evaporate. It Couldn't Get Worse Right? In 1995, a change in the New Zealand standard for Timber Treatment (as referenced in Acceptable Solution B2/AS1 of the Building Code) allowed the use of untreated kiln-dried timber in wall framing. If this untreated timber framing gets wet, it starts to rot...quickly! Now put these two situations together, poor design and construction methods allowing water ingression on to untreated timber framing. This was the perfect recipe for a leaky home. With the Government, councils, architects, building inspectors and builders all running for cover, it isn't something that is going to be swept under the carpet any time soon. The latest figures from a NZ Herald article dated 27 February 2010 put the problem at $23 billion affecting 89,000 homes and buildings throughout New Zealand. Louise Cosgriff, a leaky homes consultant who worked on an earlier report gauging the size of the problem for Auckland City Council, said she believed building experts were spot on with their prediction to the Government. It has long been known that certain moulds and fungi can cause health issues. Stachybotrys mould (a type of fungi) produces spores that carry chemical toxins known as mycotoxins. These may cause influenza like symptoms. They are particularly dangerous to the young, old and those with weakened immune systems. People have been hospitalised because they failed to take adequate precautions when carrying out repairs on their houses. Damp living conditions can worsen the symptoms of breathing disorders such as asthma and bronchitis. What Has Been Done About the Leaky Homes Crisis? In 2002 the Building Industry Authority, (now the Department of Building and Housing), appointed a Weathertightness Overview Group to investigate the weathertightness of buildings in New Zealand. The group visited a number of affected buildings and met with many representatives from different sectors of the building industry. In its final report, (commonly known as the Hunn Report) it identified the causes of leaky buildings and made many recommendations. Since then there have been numerous changes to the Building Code and other Acts of Parliament to try and mitigate this disaster. I am an accountant, not a builder, architect or real estate agent. When looking for a house to purchase in early 2000, I started hearing whispers about "problem" houses. Shortly after, the proverbial hit the fan and the news media got hold of the story. It was distressing to see owners of leaky homes showing TV reporters the structural damage to their near new homes and realising I was so very nearly caught out. I needed to get to the truth before spending any of my hard earned money! I spent months trawling through official reports, newspaper articles and websites to get to the truth about leaky homes. What I discovered was frightening. I learnt that badly built homes quickly exhibited water damage, but if a home was well designed and built, it could take 15 years for any signs of damage to show externally. That means houses built in 1993/94 at the start of the danger period, may not be showing any external signs of water damage...yet. Buying a home is the largest investment you will make in your life. Thousands of owners of leaky homes have lost hundreds of thousands of dollars over this fiasco, some much more than they needed to. Know what to look for to Identify leaky homes before you need a building surveyor. Did you know weathertightness is specifically excluded from the pre-purchase inspections standard? Leaky home owners are often making the wrong decisions, and it is costing them dearly! This is a no risk purchase because if for any reason you're not 100% happy with this e-Book, you're protected by my 100% RISK-FREE money back guarantee. If for whatever reason you don't feel that this e-Book was worth many times your investment, simply let me know within 60 days and I'll issue you a full refund, no questions asked. Since this is an e-Book (Electronic Book), you can download it to your computer within minutes. That means you can get your hands on the latest information about leaky homes in less than 5 minutes. Time is running very very short for some home owners. Don't be like the leaky home owner who had owned his new home for 9 years only to find his home had been a display home for a year prior therefore it didn't qualify for any Government assistance packages. (All you need is a credit card - no special Internet accounts or anything like that. And it's 100% safe and secure. Your credit card data is passed directly to the bank and no one but the bank has access to your sensitive information). If you don't want to use a credit card, simply click here to contact us and we will supply other payment options. If nothing else, I hope that this website stirs home owners into taking action that could save them thousands, if not hundreds of thousands of dollars. It seems that owners of leaky homes are going to wear the majority of the cost of fixing their homes with precious little help from the Government. Time is of the essence. How often do we hear that? In this case time will cost you plenty if you don't act quickly. Take the example above where the home owner thought his brand new home would qualify for Government assistance only to find the qualifying period extended to the time it was built, not when he bought it. Don't forget about the Limitations Act 2010 that only allows negligence claims to be taken to court within 6 years of when the substandard work was done! Just because your home isn't showing signs of being one of the 89,000 leaky homes right now, but it was built between 1993-2004, you can take appropriate steps to lessen damage early and save thousands. Imagine the horror of lying in bed at night listening to the sound of dripping water every time it rained, or watching that circle of black mould on the ceiling or wall getting bigger and bigger. If you are about to make an offer on a property, how much is it worth to you to be able to identify if it is a leaky home? Plenty I suggest, so this e-Book with the 60 day MONEY BACK GUARANTEE could be the bargain of a lifetime!